From Royal Mail to USPS. Rolando appoints Renfroe as EVP; other leadership shifts. New president, new Congress, new challenges. Political mailers a win for USPS. Tips for sharing photos on social media. Delivery by Uber? A letter carrier and his bike. Letter Carrier Political Fund—Why I give. Joint Statement on Violence turns 25. While PRC kicks off rate review, Board of Governors loses last governor. Food Drive around the corner. NALC HQ hires two. 2015 MDA bronze-level branches. COLA news. NALC adapts legislative strategy. NALC’s legislative and political network. Get the NALC app. Making a difference, one Food Drive bag at a time. Love on the run. Filmmakers set out to tell letter carriers’ stories. Remembering the Great Postal Strike. Going the extra mile for MDA. Postal reform bills voted on by committee. Labor unions regain popularity. Counting down to Food Drive No. 25. April a reminder to focus on workers’ physical and emotional safety. With a song in their hearts. Drone delivery: Future or fad? NALC activists lobby for meaningful postal reform. The first food drives. After years on registry, carrier made a match to donate marrow. TSP delivers on retirement investments. Carrier remembers Pearl Harbor bombing. National Agreement. Food Drive. Engaging new carriers. USPS shows operating profit. Reform’s road map through Congress. Scholarships awarded. No stopping for Parkinson’s disease. The map maker. CPR can be the difference between life and death. NALC activists review contract. Incredible Food Drive results. Postal bill receives positive CBO score. White House unveils budget proposal. NALC president is getting locked up…for MDA. Know the warning signs for a stroke. Customer Connect. Car and Carrier. Staying engaged over Congress’ summer recess. Oakland CCA shot while delivering in LLV. Delivering the gift of sight in Honduras. Impressive results for 2017 Food Drive. Carrier donates kidney. 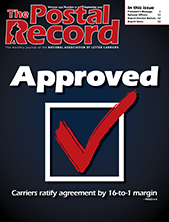 Carriers ratify agreement. USPS, letter carrier benefits targets in budget battle. Senate committee holds hearing on Hatch Act. Preparing for the end. Giving the final gift. Carrier’s marathons add up for Mile 19 film. Stories of Texas letter carriers dealing with Hurricane Harvey. CFC. New contract’s pay increases and adjustments update. News from Washington, DC. What you need to know about skin cancer. NALC Executive Council meets. Graceful Envelope. Proud to Serve. 2017 Heroes of the Year. Hurricanes take toll on carriers. HBP packaged to deliver. Congress working to pass budget. NALC members honor veterans through flight. PRC’s review nears end; what’s next? Convention venues for 2020, 2022. Regional appointments. Getting in the spirit of the season. FY ’17 financial report. AFL-CIO Convention. CA carrier saves life during Vegas festival shooting. Northern CA wildfires affect carriers. Detroit convention hotels. Open Season. ‘Vote at Home.’ NALC Photo Contest.